Levying a carrier bag charge in Wales is benefitting the environment, local charities and retailers - and all for just 5p a bag! Matthew Quinn from the Welsh Government explains how it's working. Wouldn't it be a good idea to implement this in England as well? We always used plastic carrier bags for bagging waste prior to throwing it in the bin. In particular food waste. If these bags are to be taken away then we shall purchase swing lid bin liners in their place. I suspect many others will do similar. How then will this benefit the environment. 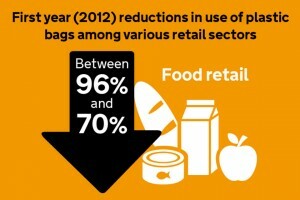 Surely the answer is not to get rid of bags but to make them bio degradeable. ?